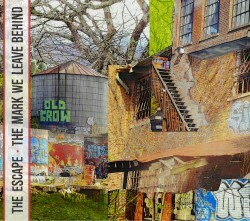 The Escape release their second EP The Mark We Leave Behind on July 28th. It’s a big alt-rock sound that will appeal to fans of Rise Against, Bayside and Foo Fighters. It marks a progression and growth since their 2013 debut New Direction. It’s more cohesive, stronger and radio friendly. Opener ‘Soon Forgotten’ is a big slab of alt rock that has all the hallmarks of a stadium filling band. Its big, dynamic sound will have mass appeal; the crunching riffs are offset by an accessible vocal. “The lyrics for Soon Forgotten are where we got the title for the record “The Mark We Leave Behind” The song asks the question, what’s left at the end of the day for the next generation to remember us by, when we have gotten carried away with our excess and less than noble ways of life.” – Stephen Angello, vocalist/guitarist. Both ‘What Happened To Us’ and ‘Underwater’ continue in the radio friendly vein. These are big rock songs and their accessibility cannot be underestimated. The latter has a particularly catchy hook that ingrains while ‘Two Steps Forward’ treads the big emotive rock song water that you expect will gain the band a whole new legion of fans. ‘Living In A Dream’ gives further proof that The Escape excel in anthemic mainstream rock. Inoffensive and easy on the ear, The Mark We Leave Behind is bound it infiltrate the legions of alt rock fans and become and essential release of 2015. ‘Waiting’ is the strongest track on the EP, glimpses of guitar solos and the structure propel the track to level above the rest. The Mark We Leave Behind shows The Escape as a band that are intent on becoming huge and breaking their way into the mainstream. A solid and enjoyable EP, maybe just a little safe.